John Porter once had a farm in a strange and distant land called Hopkinton, Rhode Island. I read about it in a family history book as a youngster growing up in Southern California. It said that my Great-Great-Great-Great-Great-Great Grandfather John Porter was buried there on that farm. One of my extended cousins, Veda Porter Mortimer whom I had never met, had visited the grave in the 1950s and had found the plain uninscribed “native granite” grave markers still there. To my young imagination I felt it would be the most wonderful thing to go and visit such a grave. Seeing as it was about 3,000 miles across the continent, however, it was not a likely adventure. 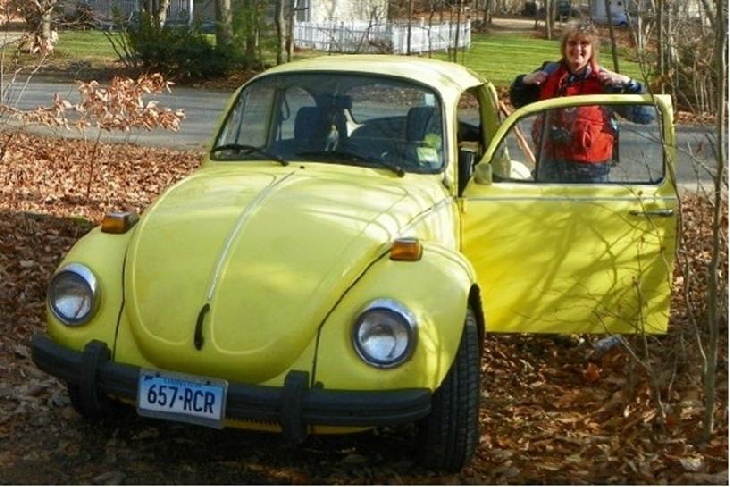 As it turned out, my life’s journey took me to live in southeastern Connecticut with my new husband, John, in 2001. We were both interested in family history research and headstone hunting; so for one of our first dates, John had taken me to New Haven to visit a few known graves of my Colonial ancestors. We were a match made in heaven! Nevertheless, a few years passed, before I realized that the old Porter farm and John Porter’s grave, in particular, were somewhere right over the state border from me. As my childhood wish now became a possibility, the reality loomed: how do I even begin to find such a grave? I learned that Lorraine Tarket-Arruda had been working on the Rhode Island Historic Cemetery Transcription project for the last couple of decades or so. She asked who the family was. When I said, “Porter–John Porter,” she commented that was interesting because she had been trying to find his grave for a friend of hers, but unfortunately, they had been unable to locate it. Disappointed, I asked if there would be any way of locating the farm where he’s buried by looking at the deed? She explained that it was impossible to determine locations from the old deeds due to the vagueness of the descriptions. There just were not any currently identifiable landmarks. That should have been the end of my search, I suppose, but I wasn’t ready to give up so easily. Instead, the conversation galvanized my resolve that I would learn something… somehow… about the area where the Porters used to live. I went back to the place to which I would return a hundred times over the next few months—to the deeds. The deeds were my one tangible connection to my ancestors, to their lives, to their knowledge, to their world. My mother had given me her copy of Porter Family History Vol.1 (Joseph Grant Stevenson Editor, Delta, UT 1957). John Porter’s youngest son, Nathan and his second wife Susannah, had a son, Sanford, who is my connection to the family. The book is mostly Sanford’s autobiography, about growing up in Vershire, Vermont, and eventually heading out West, with sketches of his children. But early in his story he describes his father and mother and tells of a time when he accompanied his ne’er-do-well half-brother on a trip to sell re-fluffed used feathers as new to the trusting souls of Hopkinton, Rhode Island. It was from Sanford’s account of this visit to the old family farm where his father grew up and to the grave of his grandfather that sent our modern family historians to Rhode Island to learn more. The book shared their research up until the 1950s, and included transcripts of a few deeds. Knowing the farm was along a highway on the east side was something—but which highway? And the grave was along a “driftway”. What the heck was a driftway? An online dictionary told me it was an old farmer’s road, a common way, or path, for moving cattle, sheep, or other stock animals. I learned that here in Connecticut they were also called “pentways” and were lined with parallel stone walls to keep the animals from wandering into their neighbor’s fields and gardens and squashing their pumpkins. Another question I had was how long was a “rod”? Another online dictionary said a rod was 16 feet, which made the cemetery I was looking for about 32’ x 32’. It occurred to me that although I did not know where John Porter was buried, perhaps there was a cemetery for the Witter family, whose properties almost completely surrounded the Porter farm. Early on, I stumbled upon websites about Hopkinton which included a list and locations for its various known cemeteries. Sure enough, there was a Witter cemetery lot east of Tomaquag Road! And seemingly confirming my method, there was a street just north of it, on the west side of Tomaquag Road called Tanner Lane. I speculated that perhaps long ago this lane could have been an access road to Abel Tanner’s property which lay to the west of the Porter farm. Looking at my family genealogy, I realized that John’s son Nathan did not go very far to find his mate. His first wife turned out to be Hannah Witter, the daughter of John and Ann Witter and sister or relative of his other Witter neighbors. I had less luck locating cemeteries for the other neighbors. I then considered the “Unknown Cemeteries”. These were burial sites where the markers were all plain field stones, without any inscriptions. In the Colonial and Revolutionary War eras, few had money for fancy grave stones with inscriptions or carvings. Most marked the graves of their loved ones with a simple flat stone. This was the type of marker that would be on John Porter’s grave. Over time as families moved away and others took their place, the identity of these graves had been forgotten. It was possible that John Porter’s grave could be in one of these unknown cemeteries. I looked to see if there were any unidentified burial lots in that locale and found there was an Unknown Cemetery #74: “700 ft west of Tomaquag Road at Telephone pole # 4”. I was sure that must be at the end of Tanner Lane, counting telephone poles from the Collins-Tomaquag intersection. I was ready to make my first visit to Hopkinton to see for myself. For help with my quest, I enlisted my friend, Carol Hallas. 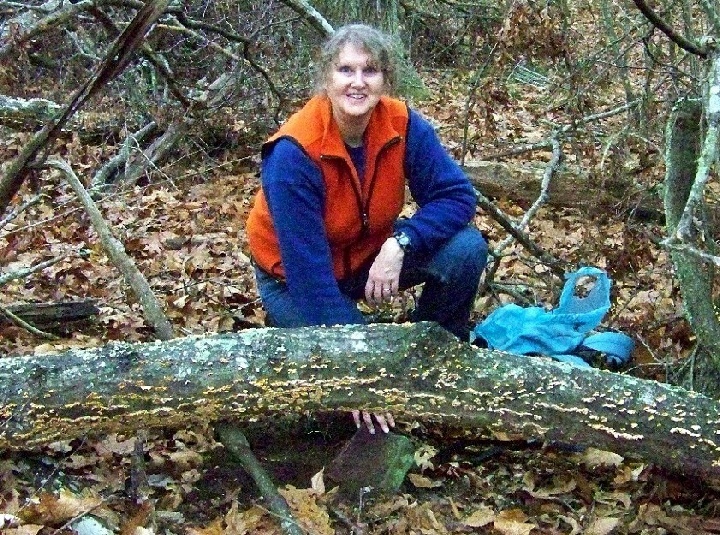 She is an avocational archeologist knowledgeable in Colonial and Early American Technology. She has worked countless digs with Connecticut’s State Archeologist as well as for archeology firms, and had headed up her own excavations. She had also given numerous presentations on these topics to interested groups. We became acquainted due to mutual interest in a Colonial site in the woods near my home, the farm of some of her ancestors. It was rare to find another female who enjoyed bushwhacking through the woods exploring the remnants of the past, so we became fast friends. The last few years we had explored stone chambers and sheep dips, and I had learned to recognize differences in foundations and the possibilities of standing stones and calendar alignments. Carol was also an old hand at cemetery hunting, so was undaunted when we saw that the old Tanner Lane was now sporting a “Keep Out” sign. The Telephone Pole was #44 instead of #4, but I assumed that the utility company surely must have renumbered. In any case, this lane was what I had come to see. We went up to the house on the corner and met Sharon Power. Carol told her we were looking for a cemetery in the area and wondered if she knew of any? She didn’t believe so. Then Carol asked about the “pentway”, the lane alongside her house. Did she know what was back there? Sharon said that it was her neighbor’s driveway and the owner didn’t like people going up there, but that she had permission to use it to walk her dog. It just so happened that her dog was in need of walking, so invited us to go along with her. The road name “Tanner Lane” is today attached to a short street to the north, but this east-west path was the original. The driveway was lined with the tell-tale parallel stone walls, announcing to anyone who understood its language that it was once a significant roadway. We walked west for about 700 feet when the road made a 90 degree turn to the north. The walls widened and fanned out into a very large “V”. A small and recently remodeled house sat to the north of the V. Someone had added medium-sized boulders along the right side, funneling cars into the yard, and unintentionally creating an enclosure. I was puzzling over the old and new stone walls, when a feeling came over me that is hard to describe. It was to me a spiritual moment of transcendence, for those who believe in such things, of somehow connecting with the past. I felt perhaps this was a place of significance, but did not know why. We could not see any signs of a burial site, but as we were heading back, Sharon mentioned that we should talk with her neighbor, Tom Helmer. She said he had been exploring the woods and had made maps for a book he was writing. Sharon’s daughter Meagan arrived home from school just then and told us she knew of a cemetery. We piled in the cars and she led us south down Tomaquag Road to one of the Babcock family burial lots. It was much more recent than we were looking for, but we enjoyed encouraging the next generation of headstone hunters. It began to rain then, bringing our exploration to an end. A few days later I called Tom Helmer. He was very friendly and eager to speak to someone interested in his work. He was able to explain a number of things to me. He believed that the road widening into the “V” as it did was so that wagons were able to pass each other. He had documented the stone walls and wells around the “little house” or “the old Jordan place”, as he called it, and believed it was an old farm homestead. Prior to the remodeling, there had been a number of enclosures or pens in the yard, which families would have used to separate gardens and animals. Also the smaller “footprint” of the house, compared to more recent homes, suggested it was from an earlier era. [See Tom’s Map Tiles 12 and 7] I was disappointed that Tom knew of no cemeteries or possible graves at the end of the old Tanner Lane, but was encouraged that perhaps…just maybe…this could be the 1744 Porter homestead! Tom sent a copy of his book to date, which consisted then of three chapters, with copies of his maps. His glorious maps! Opening the package was like lifting the lid on a treasure chest. It was an amazing amount of work, noting stone walls and their directions, foundations, cemeteries, interesting rocks or other cool items. And everything was GPS’d! I pored over his maps and compared them with aerial photos. My favorite website was http://maps.nationalgeographic.com/maps because their photos were taken in the wintertime, when the trees were without leaves. I could often make out the presence of stone walls. I learned about transposing square footage and square yards from the aerials into acreage in order to test my theories. Just how large was a 25 acre or a 110 acre farm? How much area would it encompass on a map? And did that fit within stone walls that could be boundary markers? And always, I looked for what could be the “driftway” along which John Porter was buried. Tom had indeed identified an old roadway that ran north-south to the west of the old farmstead. Tom had also documented the location of a colonial era Grist Mill, built by Jedediah Davis, somewhat to the southwest of the homestead site. This caught my attention because my Porter book mentioned a deed for a Grist Mill! We chose an unusually warm 60 degree December day to go see it. Carol and I arrived at Tom Helmer’s at 10 AM, but we almost never went. Feeling responsible for people’s safety, Tom wanted each of us to take a walking stick. An admirable, but undesired concern to the very experienced and assertive New England native, and Carol told him so. The man from New Jersey was very determined, however, and for a moment I thought they might come to blows over the walking sticks! Being from the West and more passive aggressive myself, I played peacemaker so that I could go see the Grist Mill. We traveled the route of Tom’s Walk # 1, following the wall from his backyard to the east until we came to Gap 11, where we turned south to Cellar Hole 7 [See Tiles 12, 11, 10]. Tom was impressed once he saw Carol’s sharp eye and knowledge for himself, and as a peace offering declared we would never have to take walking sticks again! Carol, nonetheless, teased Tom relentlessly about being from New Jersey, as is her own husband. I, meanwhile, was brushing off five or six ticks crawling up my pant legs at each rest stop! I have never before or since seen so many ticks on a single outing! We continued south towards the dam and Grist Mill. After fording a small stream, we came to a large enclosure, maybe 200′ by 300′. Tom’s earlier GPS sheet had a notation for “Cem01” in this area, although he had not plotted it on the map. The note read, “Possible cemetery, single upright fieldstone, or just chance placement.” I wanted to check it out. We all went in different directions. About in the center of the enclosure, I suddenly noticed a small upright, flatish stone. I was quite excited. Had I found John Porter’s grave?! I called for Carol to come and take a look. She used her trowel to brush some dirt away from the lower part of the stone. No inscriptions could be seen, not even initials. Tom came over also. We were debating about whether it was a grave marker when Carol solved the dilemma by finding a footstone. Another small stone was positioned to the east six feet away. Then one of us saw another fieldstone and then another–both head stones and foot stones. In all we found about five or six graves, but did not do a comprehensive search of the enclosure. Tom declared we had hit a home run, and was anxious to tell “Lauri”, to have it added to her list of Hopkinton’s Historical Cemeteries. We continued west, through an old roadway now thick with thorny bull briars, until we reached Tomaquag Brook just below the dam. This is the heart of what is known as “The Colonial Village”, which Tom describes in detail. From there we headed downstream to the Grist Mill. Before long, we came to the remains of the Grist Mill dam. We could see the stone wall built up along the western side. Carol spotted a small stone chamber-like mouth on the upstream side, which I realized must have been like a stone pipe. That end was for intake and then down steam was another opening where the water was directed out into what Tom described as the water wheel flume. All without a bit of cement. There was a channel of water diverted along the east bank as well. Carol speculated that it may also have fed a mill of some type. We took a snack break here with the granola and fruit we had brought. I went across the east channel and relaxed on a large rock at the point of a little island. I took pictures knowing this was a place where my ancestors had walked. They must have done business here, and I assumed at the time this was the mill John’s son Nathan had owned, if only for 2 years from 1783 to 1785. Since that time, I have learned that the Jedediah Davis Grist Mill remained in the hands of the Davis family throughout the 1780s and for decades after, so could not have been the mill that Nathan Porter purchased in 1783. To date, I have been able to trace Porter’s mill down to Nathan Kinyon Jr., but haven’t yet a current location. When Carol and Tom began laughing uproariously, I left the 18th Century and rejoined them. Tom was trying to tell me that Carol’s husband was going to give him a medal for some reason. For what, I wasn’t sure, though I had the impression it would be for surviving Carol’s sauciness. We were interested in going on south to the site of the Fulling Mill, but Tom was beat; so we left that adventure for another day. We headed back out to the world, backtracking Tom’s Walk #4, stopping at interesting sights along the way. It was a wise choice as Carol and I were also very tired by the time we picked off a few more ticks and climbed into Brenda’s car on Colonial Village Road. I have to admit to feeling unsettled afterwards. We had seen and found many interesting, even amazing artifacts where not too much had been disturbed over two and a half centuries. We had walked roads that my ancestors had walked. Nevertheless, I was a bit disappointed that I had not found a cemetery that definitively fit John Porter’s burial site. The North-South road adjoining the cemetery we found did not possess the parallel walls of a driftway. Plus, the enclosure around the graves was far too large for the 32 foot square of Nathan’s description. Lastly, Carol did not think they would have buried him so far from the house. I kept wondering how Veda Porter Mortimer found the grave in the 1950s and hoped that information still existed. I was able to make contact with her son through a family website. George Mortimer remembered assisting his mother in researching the town archives when he was a lad of 14, but he was not with her when she found the grave. He advised researching the deeds and working with the town clerks who are knowledgeable about the town’s history. He was right, of course, although I would be slow in fully implementing the advice. Instead, I went back to square one, re-read the copies of deeds I possessed, and questioned my assumptions. And I began to review the little we knew about who John Porter was. Sanford said his grandfather originally came from Hartford, Connecticut, although some researchers believe John and his wife Desire Porter were from the Kingstown, Rhode Island area. The first reference I know of them is from a very faded listing of their children in the Westerly Town Clerk’s archives dated 16 December 1742. It lists eight children for them from Timothy born 15 December 1725 to Nathan 26 June 1742, four boys and four girls. Some have equated Desire Porter with a Desire Sanford of Westerly, except that while our Desire is busy having children with John Porter, Desire Sanford seems to be married to a Celeb Cooper of New Haven. In family research, if the dates don’t make any sense, then it is probably not your gal or guy. Desire Porter was an active member of the Sabbatarian Church and is named in its governing committee meetings until after March of 1742 when her name disappears from their records. It is very likely that she died, perhaps due to complications from Nathan’s birth. While seeking the grave of John, I have also wondered where Desire was buried. Perhaps she lies in one of the unidentified graves of the Sabbatarian section of the First Hopkinton Cemetery. John Porter made his living as a tailor somewhere in Westerly before purchasing his homestead farm in 1744. He is still described as a “Taylor” on a 1761 deed, but is called “yeoman” or farmer thereafter. Although there is much work to run a farm, he likely continued sewing clothing on the side. There were “15 yards of new cloth” and “some needles” among his personal effects listed in his Probate Inventory of 1771. One mystery I was able to solve was why the Founder’s stone in front of the Town Clerk’s office lists only a “Timothy Porter”. 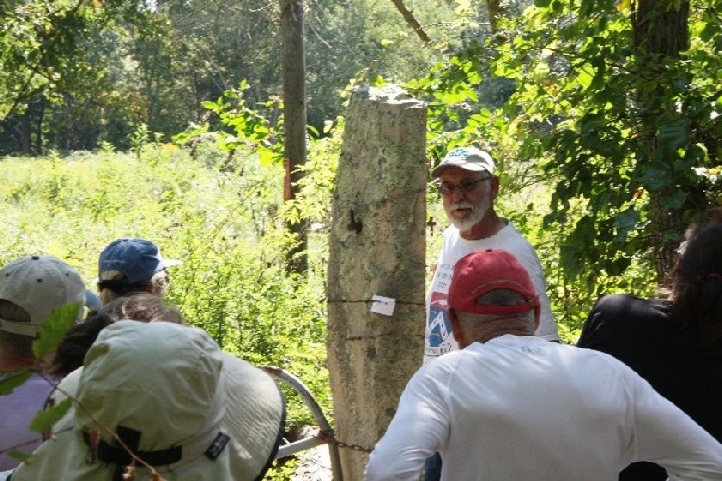 Lauri discovered that the names on the stone were taken from a Westerly town census of “freemen Living on the North Side of the Pauquituck River” (sic) in 1757 when Hopkinton separated. Timothy Porter, John’s eldest and also a “Taylor”, bought 13 ¼ acres somewhere to the northwest of his father’s property in 1752. John Porter was not entered as a “Freeman”, or a voting citizen of the newly established Hopkinton, until June of 1758. Adding to the confusion for descendents, his grandson Sanford ran into a Tanner cousin while in the Utah Territory who claimed to have known his grandfather. This family acquaintance told him his grandfather’s name was “Timothy” and that people called him “Old Timp”. The deeds and documents make clear, however, that Nathan’s father was indeed John Porter and there is no evidence that John had a middle name. It is possible that after their mother passed away, Timothy Porter did much to care for the younger children. Timothy being 17 years older than Nathan perhaps led this acquaintance to think that he was Nathan’s father. Family History can be confusing and full of mysteries, and sometimes there are just no sure answers. John Porter married twice more after Desire. A Rebekah Porter appeared with him on a deed for property John sold to his son Nathan in 1764. A Thankful Porter shows up on the deed when John sells the homestead to Nathan in 1769. I know little about what happened to the other Porter children. We know Timothy was married by 1750, as my sister April Harrison found that Westerly issued Timothy and “his wife” a certificate to recommend them to Charlestown. They returned to purchase Hopkinton land in 1752. I do not know whether Timothy died or moved away after June 1761, when I last found him referenced in the deeds. John’s sons John and Samuel each left home at 21 and sought their fortunes in the New York Colony. John Junior became a farmer; Samuel was another tailor. John’s daughter Sarah married Job Babcock of Westerly. The fate of the other children, Hannah, Desire, and Thankful remains a mystery. There is one other Porter I should mention. Their neighbor Samuel Witter married a Tasy Porter in 1769. Samuel was Hannah Witter’s brother. Without a birth record for Tasy, we cannot say with certainty who her parents were. We know that Samuel was born in 1745, so Tasy could have been Nathan’s younger sister, or even a step-sister. It is also within the realm of possibility that she could have been a daughter of one of the older Porter children. So many mysteries. With more of a sense about John, but a great deal less certainty about my theories, I again pored over the maps and compared them with aerial photos, zooming in, out, and back in again when… Whamo! There in front of me appeared a perfect set of parallel stone walls on the screen before me! Where have they been all this time?! Carefully zooming back out to see the location of these double walls, I discovered that they were north of Collins Road, about halfway between Maxon Hill and Tomaquag Roads. There were parallel stone walls that went North-South and also East-West. Tom had confirmed my suspicion that Collins Road was a relatively new street. He told me that Tanner Lane once continued on past the “little house” farm site going a bit to the west, then turned north and ambled all the way to Hopkinton town center. The 1943 map showed a dirt road going up the middle of the Tomaquag Valley “northern square”. It branched half way up, the left fork heading to “downtown” Hopkinton, as Helmer had described, by way of what is now Kenyon Lane. The right branch once came out on Woodville Road, near where I believe the Abel Tanner farm once stood. The dirt road on the map coincided with the parallel walls in the aerial shots. I wondered, could this old road be the “driftway” I was looking for? It came to mind that on the Hopkinton website there were two unknown cemeteries located to the north of Collins Road. Unknown Cemetery #71 was described as 30′ x 30′ with 10 burials. Unknown Cemetery #70 was 20’ x 40’ with 10 burials. Neither had enclosures, but were close to the size I was looking for. Could it be that simple? I had assumed that the deed described a single burial and within a stone wall enclosure, but now I reconsidered. Was it logical to create a burial area of 32′ x 32′ for only one person? Other families might have utilized the cemetery afterwards. And the deed did not actually state there was an enclosure or wall surrounding it. Another assumption bit the dust. In any case, I thought my next step should be to check out both of these cemeteries and their relationship to a possible driftway. Carol and her retired husband were now spending their winter in Hawaii, so I asked another friend, Robin Hagen, to go with me to check out these cemeteries. She was terrified of ticks, and the Lyme disease some carry, but I promised that this time of year we should be OK. It continued to be a mild Winter, so early in January of 2012, Robin and I headed for Hopkinton. We found the telephone pole for Cemetery #71 on Collins Road just to the west of a branch of the Tomaquag called Davis Brook. To the north was a dirt road into what I would learn was the Elm Rock Farm. I thought the dirt road might be the remains of an old driftway, and perhaps allowed access to the cemetery. As we walked up the dirt road, a truck came up behind us. The driver was understandably annoyed that we were on her property! We apologized and I quickly explained I was searching for the grave of my ancestor. She softened then and showed us to the burial lot, telling us she believed it was of the Langworthy family, who previously owned the land. When I told her we knew from a deed that John Porter’s grave was on the east side of a driftway, she told us, “Well, the driftway is over there,” pointing to the east side of the brook. She said it was land trust now, and a hiking path. The trailhead was up in Hopkinton behind the maintenance garage, but she thought it would be all right to cross the field to get to it from Collins Road, as long as the cows weren’t out and we closed the gate behind us. She also mentioned that we should talk to a Bob Miner who knew the woods really well. So I had it confirmed that this old North-South road with parallel walls had been known as a “driftway”. This new information would prove invaluable. Our plans quickly changed. Now I wanted to look for John Porter’s grave along the driftway. We saw no cows, so we crossed the field and headed up between the double stone walls. We stopped to examine anything along the east wall that might indicate a cemetery or grave. Not too far north, I noticed a large stone wall enclosure. Even without their leaves, the vines and thorns were thick and formidable. I had to conclude it was too big to fit Nathan’s 32 foot square, and I found no signs of grave markers. At the north end of it, there was another wall of cut stones, a foundation of a building or house. We discovered that this sat on the corner of an intersection of North-South and East-West driftways. Stepping into the intersection, I felt as though I had stepped through a portal into the past. Several old Maple trees lined the way, with one on the northwest corner and a very thick and distinctive old Sycamore Tree on the northeast. I have learned there are more Sycamores in the area and they were all likely known by my ancestors in colonial times. I imagined the people who had once lived and worked here, as well as neighbors and strangers driving their wagons and riding their horses on their errands. With neighbors so spread out, they no doubt welcomed those who would stop along the way to greet them, rest their beasts of burden, and catch up on the news of the day. After exploring a little more, we continued north again. We kept an eye out along the eastern wall, but saw no more signs of an enclosure or a stone that could be a grave marker. We went as far as a pond on the west side of the driftway where a sign on a tree declared “Hopkinton Land Trust”. The sun was heading for the horizon, so without more definite information about where to look, we headed back to the car. In the waning light, we stopped at the telephone pole landmark for Unknown Cemetery #70. Its location did seem promising as a burial for the “little house” south of Collins Road; however, there was no obvious public access to it. My exploration of Cem #70 became a bit of a detour, but served an important purpose. Lauri in the Town Clerk’s office directed me to the property owner for permission to visit. Unknown Cemetery #70 was a lovely hilltop burial site, and even came with a ghost story! Exploring to the west, I mistook an oblong stone wall enclosure to be a driftway connected to a North-South wagon road, and for a few weeks concluded this must be John Porter’s burial site. “I found John Porter’s cemetery!” she announced. I confess I was quite dumbfounded as the next Saturday Lauri led Tom and myself to Unknown Cemetery # 74 from Telephone Pole #4 to the west of Tomaquag Road. Ironically, this was the same cemetery I thought should be down Tanner Lane when Carol and I came to Hopkinton for the first time! It consists of a cut stone enclosure 30’ x 25’ with two uninscribed field stones, a headstone and a footstone, in the northwest corner. but Lauri had hit paydirt, nevertheless, in that she had found John and Nathan Porter’s farm! She explained that my call had gotten her curious, and she had begun researching the deeds. Nathan Porter, we knew, had sold the land with his father’s grave to Zebulon Weaver in 1785. She discovered that Zebulon Weaver’s son had sold it to John Congdon in 1805. Congdon’s children had inherited the land, and Lauri had found in the Probate records of 1831 that there was a drawing of the various lots inherited along with the acreage for each! One of the land tracts in the drawing was of an unusual shape, which Lauri recognized from current town maps. Once matching the location for that tract, the rest of the lots fell into place. The location of the land was still along Tomaquag Road, but much farther north than I had previously considered. The lots in the drawing were stretched out diagonally, straddling both sides of Tomaquag Road, and all the way to and across Woodville Road! At home, I poured over the copies of new deeds and maps Lauri had provided for me, and I quickly realized a couple of problems. First, was the question of acreage. Nathan had sold to Weaver 110 acres. Weaver had sold to Congdon 90 acres, but Congdon had left to his children 180 acres. Certainly not all of the 180 acres shown on the probate map could have been Porter land. How do I determine which combination of land tracts was the Porter farm? Another problem was that the language for the boundaries could be vague in its orientation. Did “bound easterly” mean the boundary ran easterly or was the boundary on the east side? The Weaver deed was the clearest, stating both “[the border] running Southerly bounded Easterly”. Studying the several deeds together finally convinced me that the eastern border of Nathan Porter’s 110 acres had to be on Tomaquag Road. Not long before, I had acquired a map of Hopkinton from 1870. This map shows that the resident living in that location on the west side of Tomaquag Road in 1870 was “J Hall”. Now I understood why Lauri had included a deed for Joseph B. Hall selling the land in 1896. I would soon learn that this area is known locally as “the Joe Hall place”. Next, I came to the disappointing conclusion that the cemetery Lauri had taken us to was not John Porter’s. The Weaver deed names two gravesites on the farm in 1805. Besides the grave of John Porter, there was “also a Square Rod of land where my Honored Father Zebulon Weaver was buried on the North Side of the Premises adjoining said Joseph Collins’ Land”. As I plotted the various neighbors along the property’s boundaries, I had to conclude that the grave we visited in Unknown Cemetery #74 was that of Zebulon Weaver. So where was the grave of John Porter? I now had two deeds that mentioned his grave and both put it “adjoining the aforesaid driftway” that comprised part of the western boundary. As I matched the tracts of land to landmarks on current maps, I realized: the driftway the deeds all referred to was the same driftway that was now a Land Trust hiking trail. It was the same driftway Robin and I had explored in January! My first reaction was one of disbelief, because that western driftway is quite a ways from the 25 acre homestead on the eastern side of Tomaquag Brook. Also, I knew that particular area along the driftway is quite wet. My question was why would Nathan bury his “Honoured Father” so far from the house and in a swamp?!! Now being certain of the driftway and knowing which stretch of it ran along Porter land, I was anxious to go back again. Unfortunately, my second search of the driftway with my friend Janet Leibham occurred in the middle of summer when the stone walls and ground cover were so overgrown, it was difficult to see much. But with Janet’s knowledge of trail markers, she did point out something I had not realized before: that the Hopkinton Land Trust encompassed not only the driftway, but some of the land to the east of it. In fact, she noticed that a trail branched right into the old Porter lands themselves! The trail east followed an old 10’ wide wagon road. Due to Tom Helmer’s previous tutelage, I was able to recognize flagstones from a colonial era stone bridge and culvert. Such a bridge would only be built as part of a road. The wagon way soon came to a 12’ x 24’ cellar hole. Smaller foundations for sheds or other buildings lay nearby. I began to wonder whether this could have been Nathan and Hannah’s home at one point. If they were living here when John Porter died, that would explain why they buried Nathan’s father along the western driftway. After this trip, I decided to wait for Fall and for Carol to come back, to plan one last search for the grave of John Porter. In the meantime, I began researching the archives in the Westerly and Hopkinton Town Clerk’s offices. I was able to confirm to my own satisfaction that John Porter’s original 25 acre homestead was in fact where the 1870 Joseph Hall farm was located. In 1766, Nathan purchased 17 acres from Abel Tanner. His father’s property is along its western border and “a highway” sits on the eastern side. It is upon this piece of land that the Deer Creek Estate homes were built. Nathan continued to buy up land around his father’s homestead, eventually giving him the 110 acre farm in the northeast corner of the Tomaquag Valley. When I commented to Carol how often Nathan was buying and selling land, she informed me that early Americans used land purchases much like we use bank accounts today. From the Hopkinton Military Census of 1777, my sister learned that Nathan Porter had participated in the French and Indian War Campaign of 1762. He would have been 20 years old at the time. After coming home, he acquired 30 acres from his father for his own homestead in July of 1764 just a few months before marrying Hannah Witter in November of that year. They would raise seven children in the Tomaquag Valley, three boys and four girls. On 15 April 1767, Nathan qualified to become a “Freeman” and took the oath against “bribery and corruption”. Nathan was known as a jolly and good-natured fellow who was kind to the children. In his youth, he was known as “Hoppity Kickity”, because he could out-hop anyone in those parts. His claim to fame was that he could hop three times and kick a hat off of a ten foot pole, while keeping his feet upon landing! The Porters spent the Revolutionary War years in the Tomaquag Valley, sharing in the uncertainties and privations of that time. A Utah newspaper article from 1871 reported that Sanford’s father, Nathan Porter, fought in the Revolutionary War, although we have no other substantiation. Neither John nor Nathan signed the Hopkinton pledge of 19 September 1776 to assist in the defense of the “United Colonies” against the Fleets and Armies of Great Britain. Nathan may have been away in the militia, but why John did not sign is another mystery. In 1783, the same year the Thirteen Colonies won their Independence, Nathan Porter purchased 30 acres, a dwelling, and a Grist Mill from Zebulon Weaver, possibly with the script he earned serving in the war. The two men made a swap. At the same time Nathan bought the mill, he leased to Weaver his 110 acre farm. A little over a year after moving to the mill, Nathan’s first wife Hannah passed away 17 July 1784. Finding the deeds where Nathan Porter had bought and then sold a Grist Mill, I made another startling discovery. The documents state that the boundaries Northerly and Easterly of the mill were “lands belonging to the heirs of Nathan Tanner”. Nathan Tanner was Susannah West’s 1st husband! He was described in my Porter Family book as “Susannah’s first and great love”. The couple had wed when she was 19, but were married only four years, 1775-1779. Tanner was a blacksmith and fatally injured himself from lifting and carrying an anvil on a bet. Years after, Susannah used the tragedy to caution her family against pride and vanity. She and Tanner had two sons, Nathan Junior, and John. It was heartbreaking for me to read Tanner’s Will wherein he describes how to divide his property when his sons achieved manhood. I knew what Tanner did not—that neither boy would survive their childhood. Sanford and his wife Nancy must also have been touched by the sad tale, because they named one of their own sons Nathan Tanner Porter in memorial. As a widower running his Grist Mill and raising his children, Nathan must have gotten to know the young widow Susannah West Tanner, destined to become his second wife. Susannah was the daughter of Thomas West, an Elder in the Hopkinton Baptist Church and great grandson of George Soule who came over on the Mayflower. Susannah was known as an energetic worker and excellent weaver who made her own designs and dyes. She had been able to support her family through her skills during difficult times. She was a courageous lady who when in years to come they heard that little Sanford was being mistreated by his half-brother, she grabbed her son Samuel, jumped on a horse, and crossed two states to go bring him home. The new couple moved out of Hopkinton soon after marrying 26 June 1785, perhaps to put the sad memories of their losses behind them and make a fresh start. Nathan had sold the Grist Mill and acreage to Jonathan Potter in January of 1785, and the lease of the 110 acre farm became a bill of sale to Weaver in August. My search has taken many remarkable turns, but one of the most miraculous was the last. I had been advised to give Bob Miner a call, his having lived and hunted and explored the Tomaquag Valley all of his life. “Bob Miner has forgotten more than most people learn in a lifetime,” Tom Helmer effused prophetically. So I gave him a call. He was agreeable to showing me around “the old Joe Hall Place” which I now knew had been Porter land a hundred years earlier. I asked him whether he had ever seen anything along the driftway that looked like it could be a cemetery. He mentioned the other gravesites I had been to, but did not know of any others. This was disappointing indeed. I feared that if Bob Miner did not know of the grave, then perhaps John Porter’s resting place was lost to us. The second time I called was to set up a time to explore with him and Carol, either along the driftway or around the Joe Hall homestead. A few days later, Bob called to confirm the day and time. As we were talking, he interjected an “Oh, by the way…” It had come to his mind that years ago he had indeed come across some grave markers that were on the Land Trust. As he described the location, it sounded very promising. He explained there were no walls around it, just markers on a hill. I asked him if he had ever told Lauri Arruda about it when she was seeking old private cemeteries, but he had not remembered it until just recently. My questions specifically about the driftway, I suppose, had jogged his memory. In spite of the constant drizzle, Tuesday 4 December 2012 was another enchanted day when we once again rendezvoused with the past. Bob’s farm may have another significance for the Porter family. Evidence points to the farms South of the Porter land as having been part of the allotment of John and Mary Witter in the 1600s. His son Joseph Witter inherited much of what is now the Panther Orchard Farm and also Land Trust adjacent to the Porter southern boundary. It appears from deeds and probate records that John Witter Junior inherited 40 acres of what is now Bob Miner’s Solitude Springs Farm. The Miner’s house dates only to the 1850s, but Bob points out barn foundations that are much older. It is possible that a Colonial era farm was the homestead of John and Ann Witter, where Nathan courted his first love, Hannah. We crossed his pasture and went through a time portal, that is, down a double stone wall lined lane Bob said was part of “The King’s Highway”. This was part of the first colonial road from Charlestown all the way to Connecticut. We soon came to the Sycamore guarded intersection I had seen before. We explored along the way, and Bob pointed out so many interesting artifacts and curiosities that Carol finally had to warn us that sundown would come early this time of year. As we came to a gate, Bob and Carol agreed that the standing pillar on the west side was quite old. I wondered if this towering pillar might have been one of the posts where Nathan “Hoppity-Kickity” Porter had once shown his skill. When Bob showed us to the place, I had no doubt that this was John Porter’s grave, the site fit so perfectly with the description in the deeds. Carol found the footstone first and then I literally tripped over the pointy headstone! A tree now grows out of the middle of the grave, but the fieldstones are predictably six feet apart. Between the living and the dead trees, their roots and branches had been cradling and shielding John Porter’s resting place in their protective embrace. The hillside overlooks a vernal pool, and though it seemed stagnant and forlorn in December, I imagined that it must be a beautiful view in the Springtime. The location is documented with the Town and Land Trust for interested descendants or historians. It is possible there is more than one grave on the hillside as well. Several other flat or curious stones can be seen nearby that could also be markers of some kind. A week later Bob, Tom, and myself squeezed into my ’73 VW and visited the homestead site off of Tomaquag Road, where John Porter raised some portion of his eight children, possibly as a single father. Speaking of History… And it still runs GREAT! We explored the foundations of the house and barn, as well as numerous stone walled pens. While there is evidence of later improvements, it appears that many parts of the stone structures did go back to colonial times. A large and gnarled Ash tree stands in the yard, old enough to have provided shade to my family members. John Porter’s Probate record of 1771 tells us that among his possessions were a mare, two cows, four sheep, a hog, and two geese. Bob explained where they all might have been kept as I stood upon the flagstone front step of the house and imagined the farm and family alive once again. The icing on the cake for me was when Bob identified the dead trunk of an old white oak tree in the junction of two stone walls. The bleached white trunk was still standing sentinel, marking the Northeast corner of John Porter’s original 25 acres, just as it described in the 1744 deed. Its bark that was once marked on four sides was now almost completely gone. Amazingly, it was draped with modern surveyor’s tape, still doing its job, even in death, two and a half centuries later. I cannot end without relating one last irony in the story. Lauri and Bob both mentioned that Laurence Kenyon, a Town Clerk from 1949-1974, had bought the old Joseph Hall place cheaply for back taxes and his son sold it to the Deer Creek development company. As I understand it, they built homes where they could and put the wetlands into conservation common property and Land Trust, effectively protecting the John and Nathan Porter homesteads. Looking at the copies of deeds Veda Porter Mortimer had obtained in the 1940s and 50s, I realized it was Laurence Kenyon who had assisted her back then. They had no access to copy machines, so Kenyon had typed out a transcript of each deed and signed it in order to certify it was a true and accurate copy. I can’t help but to wonder, was it his assistance to a descendent looking for John Porter’s grave that brought the Porter/Hall property to his attention? The Porters have long since left the Valley, but perhaps we still make our occasional small contributions. So after a little over a year, my “quest” came to a close, the fulfillment of a romantic wish as a child to find lonely grave markers on a family farm. In hindsight, I probably did many things wrong or backwards. I should have researched the deeds much earlier, for example. But perhaps for myself, a stranger to Hopkinton, I needed that “boots on the ground” experience first, to become familiar with the area. Along the way, I developed a love for these old ancestral stomping grounds, their Tomaquag Valley with its current very kind and colorful inhabitants, and have learned a little more about my ancestors and their lives. I feel a deep gratitude to all those friends, old and new, who helped along the way. More than ever I hold the conviction that our ancestors wish to be remembered, and that we benefit by the remembering. A friend of mine looks at genealogy as learning about not only the static past, but also one’s own genes. I now see family history as a greater understanding of that bit of flesh that has survived death and which we have inherited within us. In a certain sense, I did not find just John Porter’s grave; I found John Porter and Nathan and Susannah, and myself. Everyone understands the concept of a bridge, but before people put an effort into constructing a bridge they simply waded across the river or stream at a shallow place. In time these shallows were marked by usage trails and became part of the “Transportation Network” of long ago. The first problem was seasonal. It was not fun to wade across any cold river or brook in the Fall through Spring. And in early Spring the water level was high, and it became dangerous or impossible to wade across a swollen river. Unless you had a boat or a bridge, you simply stayed on your side.